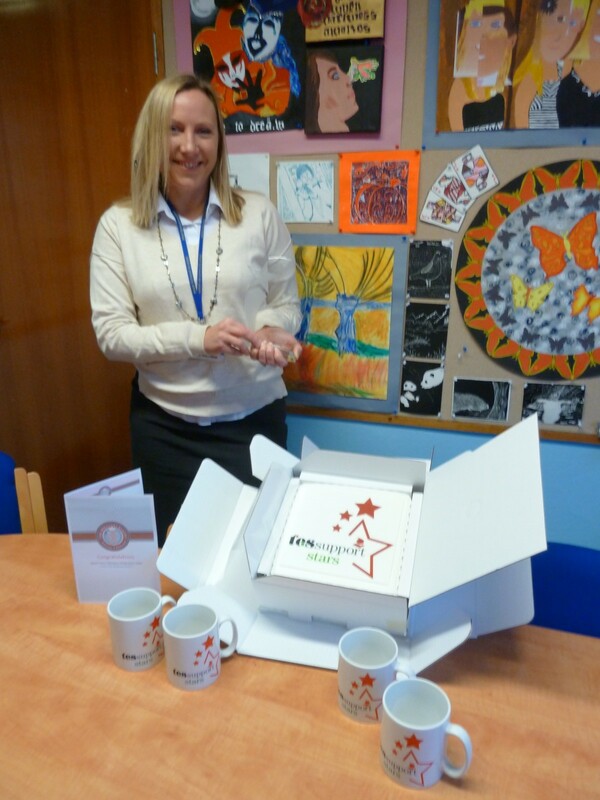 There were celebrations all round, including a nice cup of tea and a slice of cake, when Jude Hollyman, PA to the Head Teacher at saltash.net community school was confirmed as a finalist in the Times Educational Supplement’s Support Stars competition. 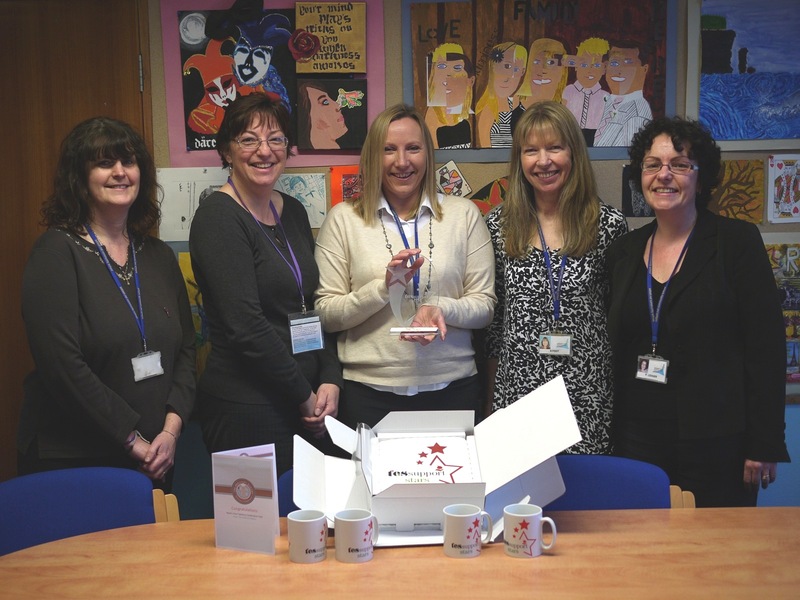 Nominated for her outstanding work across the school by Head Teacher, Isobel Bryce, Jude found herself in the spotlight when a Support Stars cake, mugs, trophy and official photographer all arrived in school to mark Jude’s national success. Jude will be featured in a forthcoming edition of the TES and will also be placed against other support staff nominees in a competition to win £10,000 of multimedia equipment for the school. 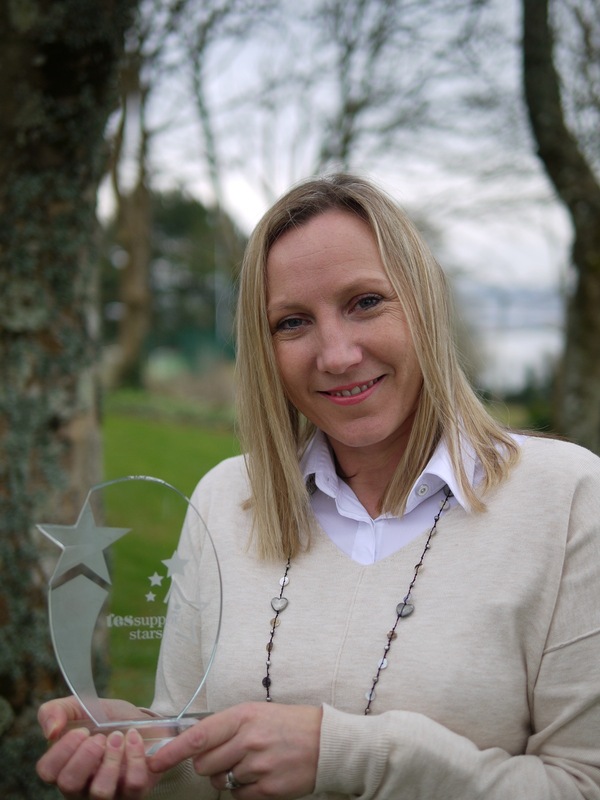 Mrs Bryce was delighted that her PA had been shortlisted for a prestigious Award especially as her support was felt throughout the school and not just in relation to PA duties. In her nomination she said, ‘Jude has been my PA for two years, joining saltash.net community school in Cornwall at the start of the Spring Term, 2011. As Headteacher at saltash.net for the last decade, I have been very fortunate with my PAs but Jude is quite simply exceptional. 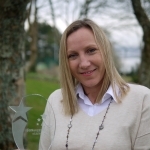 She provides an amazingly efficient service for me as Head Teacher, dealing particularly well with parents and receiving many positive comments on the way she deals with enquiries or concerns. However, what sets Jude apart is the role she plays within the broader life of the school. Three mornings a week, she dons her pinny and sets off for the school’s Breakfast Club where between the times of 8.00 and 8.35 she serves up to 200 cups of hot chocolate alongside the canteen supervisor who is dishing up the toast and cereals. This is done completely voluntarily and is not part of her job description but she knows just how much it means to our young people to have a breakfast before they commence their learning. She is always cheery and happy and the students love meeting with her first thing in the morning. In addition to this, she makes great refreshments for our Year 11 students who come and visit me in small groups at break times throughout their final year of compulsory education. Jude coordinates all of the arrangements and comes in to take the students’ orders for drinks. Not only does she always have a great supply of Kit Kats at the ready, she also takes hot chocolate to another level with the provision of marshmallows for those who like them! The students are enormously appreciative of what Jude does and the core value of Respect that she upholds. Another aspect of school life that Jude has played a significant role with is whole school Drama and Music productions. The Head of Drama department regularly acknowledges that she simply could not do without Jude’s exceptional organisational skills. For last term’s production of ‘A Midsummer Nights’ Dream’, Jude took on responsibility for all of the publicity and ticket sales and all of the front of house arrangements. The show was an outstanding success and very well attended, thanks to Jude’s efforts. Marketing and Publicity are two of Jude’s key strengths. She has forged excellent relationships with the local media and much of this is down to her people skills and great sense of humour. She works very well with our web manager and a lot of her handiwork can be seen on our website. At the heart of Jude’s work is a wonderful sense of care and concern for others. Nothing is too much trouble and she immerses herself in the range of fundraising and charity events we support. She always finds time to listen to staff and to students and has even rearranged her office so that there is a little seating area with water and mints etc when members of the school community need a bit of respite! Although Jude’s job title usually gets shortened to ‘Head’s PA’, it is really important to hold on to what PA actually stands for – Head Teacher’s Personal Assistant; Jude understands so brilliantly what it means to keep me sane and functioning to the best of my ability, even when the going gets tough! I have absolutely no idea what I would do without her or, indeed, how the school would function and operate on a daily basis.